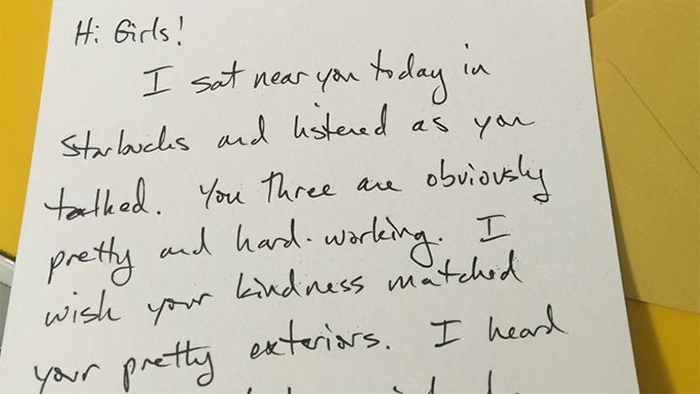 She Overheard Two Girls Talking Trash In A Coffee Shop, So She Left Them An EPIC Letter! This is a reminder that you should always be your best self – you never know who’s listening. This story comes to us from Facebook, where a young lady known as Michelle In The Middle overheard a conversation by two teens in a local Starbucks, and the conversation went sour. Instead of Michelle ignoring it like most of us would do, she got a pen and paper and did something about it. I left and went to do my grocery shopping, conflicted the whole time, and I could see the girls still sitting in Starbucks as I drove home. I ran into my house, grabbed a note card and wrote a quick, heartfelt note. Share if you this world needs more women like her to set crabby young girls straight!